The 'Load settings' option is used, either to load and completely overwrite the existing configuration file with another, or to import rule snippets into to current configuration file. For example, suppose you make changes to the existing configuration from the interface, do not save the recent changes with the 'Save settings' option, and would want to revert back to the original configuration. To do this, just click on the 'Load settings' option. The default path is displayed in the 'Filename' field. Click on 'Submit' while leaving the 'Overwrite' option to 'Yes'. This option can also be used if you have more that one configuration files, and would like to change over to another file, in real-time, from the one that you are currently using. Note: When SafeSquid is started, it by default uses the configuration file specified in the CONFIG_FILE parameter in the startup.conf. The default value of this parameter is set as /opt/safesquid/safesquid/config.xml for Linux and C:\Program Files\SafeSquid\xml\config.xml in Windows. If you have multiple configuration files, the configuration file that you would want to be loaded on startup, should always be the one that is specified in the CONFIG_FILE parameter in the startup.conf file. The value of CONFIG_FILE can be changed by running /etc/init.d/safesquid adjust on Linux, and SafeSquid Service Manager on Windows. Rule snippets are short, specific rules that are created to perform specific tasks. For example, safesearch.xml, which is available from the SafeSquid Download page, can be imported into your existing configuration file (config.xml), to enforce Google Safe Search. Similarly, youtube_safety_mode.xml is a rule snippet for enforcing YouTube Safety Mode, and ad_banner.xml is a rule snippet to block ads and banners. To import rule snippets, download the rule snippet file to the SafeSquid server, click on 'Load settings', specify the path of the snippet file in the 'Filename' field, change 'Overwrite' to 'No', and click on 'Submit'. If the file is successfully loaded, you should get a message 'File loaded'. Changing 'Overwrite' to 'No' adds the file being loaded into your current configuration file. Instead of downloading and copying the snippet file to the server, you can also specify the URL of the file in the 'Filename' field. 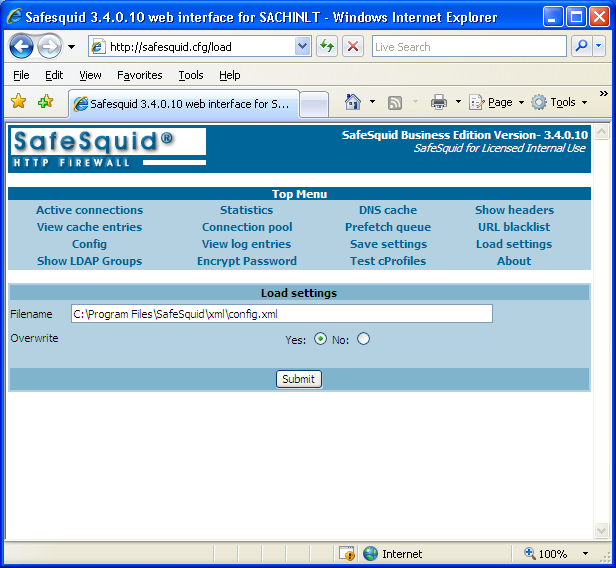 For example, the URL of the safesearch.xml file is http://downloads.safesquid.net/contrib/sample_rules/safesearch.xml. Note: The rule snippet get imported into the configuration file loaded in the Server's memory, and gets activated in real-time. To make the changes permanent, you need to click on 'Save settings' and save the config.xml file. The changes will be lost when SafeSquid service is restarted, if you don't save the file.